Q: How do you earn points & miles? Q: What types of credit cards are available for travel? Q: What are some credit card perks? Q: How do you pick a credit card? What types of credit cards are available for travel? What are some credit card perks? How do you pick a credit card? In our two years overseas, Kelly and I have implemented some simple travel hacking techniques in order to get great deals on big travel. 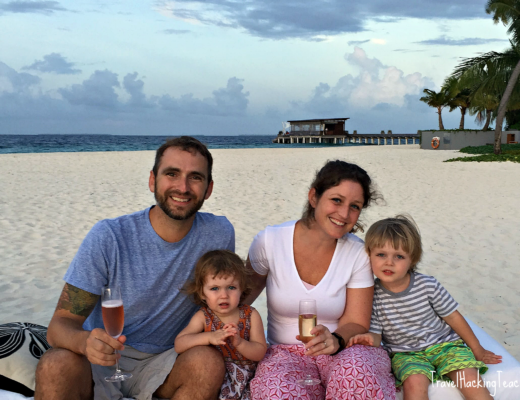 Our first winter break was split between Goa, India, and the Maldives. 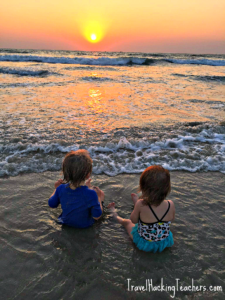 We stayed 6 nights at the Park Hyatt in Goa, in a $400 a night room for free with points. That was followed by 6 nights, at the Park Hyatt Maldives, in a postcard perfect, $1,800 a night Pool Villa for free with points and 4 free night certificates. You might notice both were Hyatt properties. That’s because we each have the Chase Hyatt credit card which came with 2 free nights (each) at any Hyatt property in the world. The additional 2 free nights in the Maldives came from transferring Chase Ultimate Rewards points to our Hyatt account. Yes! Don’t let the term, “hacking” throw you. Kelly and I are from the USA where the credit system is intertwined with the banking system. Basically, banks buy massive amounts of points & miles from airlines and hotels in order to encourage customers to open credit cards. 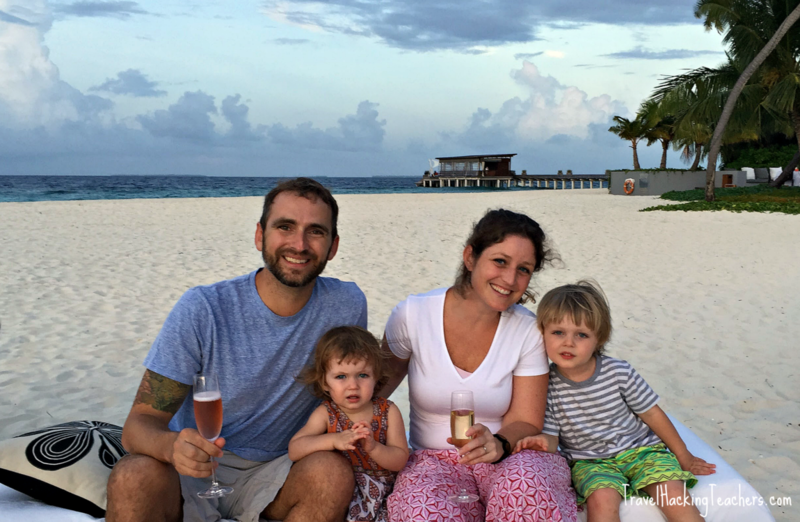 We use travel hacking to maximize those credit card reward points & miles, which then drives down the cost of travel. 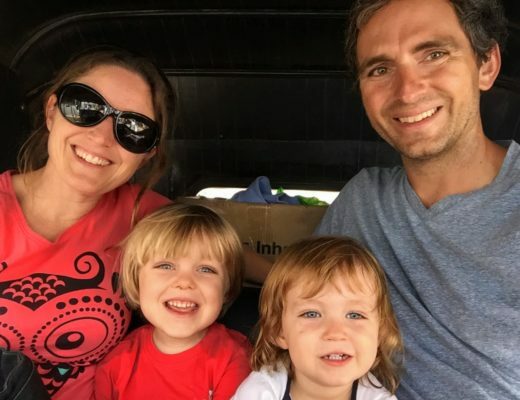 This is crucial for a traveling family of four. The fastest way to accrue points & miles is to open a travel-based credit card. With just a few credit cards, Kelly and I easily earned over 300,000 points & miles, which we have turned into free flights (although you do pay taxes) and hotel stays. Each new credit card we open comes with a minimum spend requirement in order to receive the large points & miles reward. For example, a typical minimum spend might be $3,000 in 3 months, in order to receive 40,000 rewards points. When trying to make a minimum spend, it is important to remember not to go crazy and purchase a bunch of items you wouldn’t normally buy. It makes no sense to throw yourself into credit card debt at 16% – 24% interest while trying to save money on travel. All credit cards must be used responsibly in order to gain the full benefit of the travel rewards and perks. This means paying off your full credit card balance every month. The best time to open a new credit card is when you have known expenses coming up. The last thing you want to do when you open a new credit card is lose out on the large bonus points & miles because you didn’t meet the minimum spend requirement. For teachers, that usually means towards the end of the school year, in anticipation of summer spending. There are plenty of stories about people who received over 100,000 points & miles on things like home renovations and large purchases. There are numerous other ways to earn points that don’t involve opening credit cards. Simply signing up for an airline or hotel loyalty program will score you points when you use those companies. Many airlines and hotel chains will offer points if you join their Facebook and Twitter, take a customer survey, or watch a promotional video. There are frequent deals that pop up to earn a small amount of points in exchange for your time. 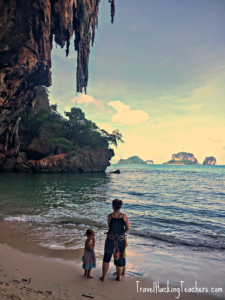 Enjoying the view while rock climbing in Krabi, Thailand. Thai Airways is part of the Star Alliance. The easiest way to organize travel credit cards is to group them into 3 categories. Airline Credit Cards are linked to a specific airline and the points you gain are tied to that airline and its alliance. In its simplest terms, an airline alliance is a collection of airlines that work together by sharing flight paths, connections, and operational costs. The biggest benefit being their shared award loyalty programs. Meaning you can fly on Airline A and collect the miles in your Airline B account. When it comes time to book an award flight, all your points are in one place, and can often be used on other airlines in the same alliance. The three biggest airline alliances are Star Alliance, Skyteam, and Oneworld. The first step we took was signing up for one loyalty program in each of the three alliances. Hotel Credit Cards are linked to a specific hotel brand such as Hyatt, Hilton, Marriott, or Starwood Preferred Guest (SPG). Hotel credit cards points can only be used on that particular brand of hotel. Kelly and I definitely enjoy beautiful beach resorts, and the hotel points make even the most expensive properties affordable. There are credit card deals available for smaller boutique hotels, as well. Flexible Points Cards are the cards that we use the most. Flexible points cards are linked to a specific bank such as Chase, Citi, and American Express (Amex). These credit cards give us the flexibility to transfer points to many different partner programs such as airlines and hotels. International teachers do a lot of flying. In the two years we have been overseas we have flown on over 20 international flights. This summer is no different. Before heading back to the USA, we are spending a few weeks in Thailand and Ireland. The cost of 2-Adult & 2-child tickets from Chennai → Bangkok → Dublin → Boston → Midwest would have cost us: $5,540. However, with the points that we transferred to British Airways from our Chase Ultimate Rewards stash, the same 4 tickets now cost us: $2,194, saving us $3,346! It could have been even cheaper had we not landed in London, as London charges notoriously high airline taxes. Most travel credit cards come with an annual fee. For a basic travel credit card, you can expect to spend $75 – $150 annually. Premium travel credit cards can range in price from $300 – $550 annually. Depending on the current promotion, the annual fee could be waved the first year. You might be wondering why on earth would anyone pay hundreds of dollars for a credit card? Generally, the premium cards come with more perks such as travel credit reimbursement, status upgrades, and airport lounge access. This is not a one size fits all question, much boils down to where you want to travel! I don’t necessarily want thousands of points linked to a small USA regional airline Credit Card when we’re planning a trip to Southeast Asia. The first thing we do when considering a new credit card is decide how we can use the award points, and how can we meet the minimum spend. Once we have a destination in mind, we backwards design our trip by seeing what airlines fly to our destination, and what hotels are available. We usually have at least one credit card from each of the three travel credit card categories (Airlines, Hotel, and Flexible Points) open at the same time. For example: If you open the Chase Sapphire Preferred credit card, then a partner credit card could be the Chase United Airlines credit card and the Chase Hyatt credit card. If you open the Amex Platinum credit card, then a partner credit card could be the Amex Delta Skymiles card and the Amex Hilton Honors Surpass card. 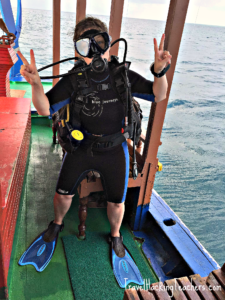 Kelly scuba diving in the Maldives! Do you have to open 3 cards at once? No, not at all. If you simply want to stick your toe in the water, then the Chase Sapphire Preferred credit card might be a good option. After your minimum spend, you would receive 50,000 (current promotion as of this writing) Ultimate Rewards points which would transfer to any of the Chase airline and hotel partners. If you wanted to spread your travel hacking wings, then opening the Chase United Airlines credit card would give you an additional 50,000 (current promotion as of this writing) MileagePlus miles for travel, and the Chase Hyatt credit would give you two free nights at any Hyatt worldwide. Tip: To figure out the redemption value of your points & miles, in it’s simplest terms, you will need to do a little math: redemption value (RV) = cost ÷ number of miles redeemed. So, a $400 hotel room for 15,000 points has an RV of 2.6¢. An RV of 2.5¢ and higher is a great deal. I would consider paying cash for RV’s less than 2.5¢. CreativeLive – CreativeLive offers a huge variety of online educational classes. 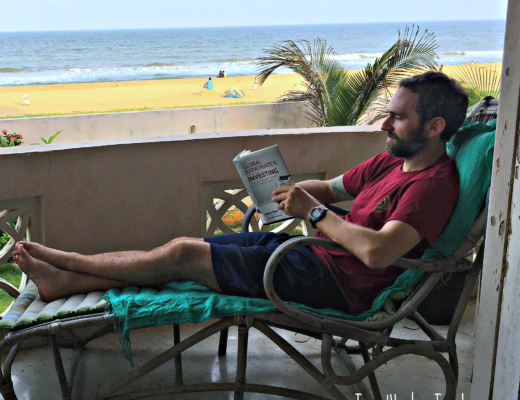 Become a Travel Hacker with Chris Guillebeau – I purchased the class in 2015 when I first started learning about travel hacking. Become a Travel Hacker is an entertaining course to watch and will give you a solid foundation into the world of travel hacking. 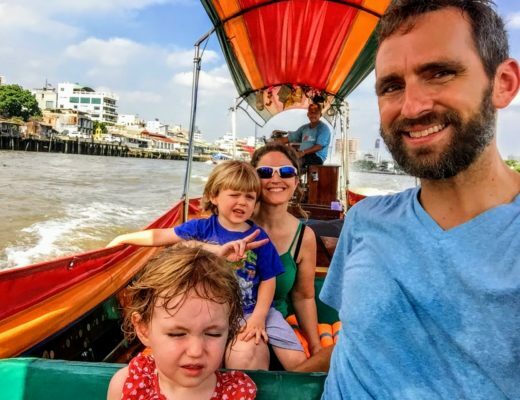 Make Your Dream Trip a Reality with Chris Guillebeau, Stephanie Zito – This is Chris’s follow up to course to Become a Travel Hacker. I purchased this class in 2016. 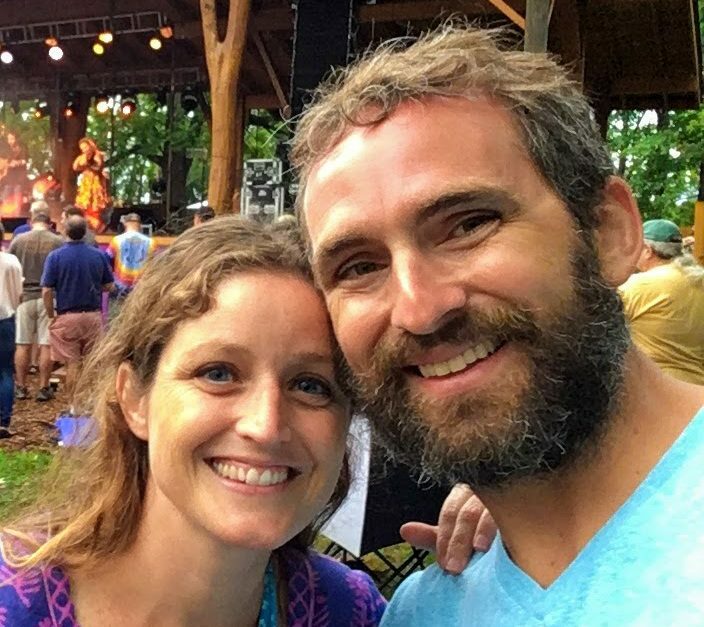 Stephanie Zito joins Chris as they present a helpful step-by-step guide to booking your dream trip, mastering points and miles, and upgrading your travel. Award Wallet – Award Wallet is a FREE site that will help you track all of your points and miles. They send you emails when your points & miles are about to expire. Almost all Travel Hackers that I know use Award Wallet to manager their points & miles. Disclosure: We are a participant in the Shareasale.com, Inc. Associates Program, an affiliate advertising program designed to provide a means for us to earn commission by linking to CreativeLive. All opinions expressed on Travel Hacking Teachers are our own. Enjoy! Great tips! Thanks so much! As an International Educator this is great advice! I needed this info! Aundrea, thanks for the feedback. I’m glad it was helpful! We’re excitedly planning for spring break and summer travel, and updating the blog with new information. All the best!